With quarterly revenue growth of 83 percent and profit growth of 95 percent, we’re firing on all cylinders. We will continue to innovate on all fronts throughout the remainder of the year. However, there was nothing “magical” about the iPad, and the “also sold” in Apple’s press release really tells it all. Whether it’s constrained supplies or lack of interest, the number for iPads may result in recalculations of estimates of upward of 30 million iPads for 2011. However, the iPad is only one of four major product segments, and the news is much better for the Mac. Mac sales increased 28 percent from last year, with 3.76 million sold, sharply contrasting with aggregate PC sales. Both IDC and Gartner (s it) have reported single-digit declines for PCs, and arguably those declines are at least partially attributable to the iPad. That cannibalization of traditional computer sales has not impacted the Mac. In fact, we are likely seeing the third-generation of “halo effect,” where first the iPod, then the iPhone, and now the iPad increase Mac sales by affection. As to which Macs are selling, the refreshed MacBook Pros, likely combined with continued strong sales of the MacBook Air, pushed laptop sales to new highs. Apple sold 2.75 million laptops, compared to 1.01 million desktops, with laptops accounting for 73 percent of Mac sales for the quarter. 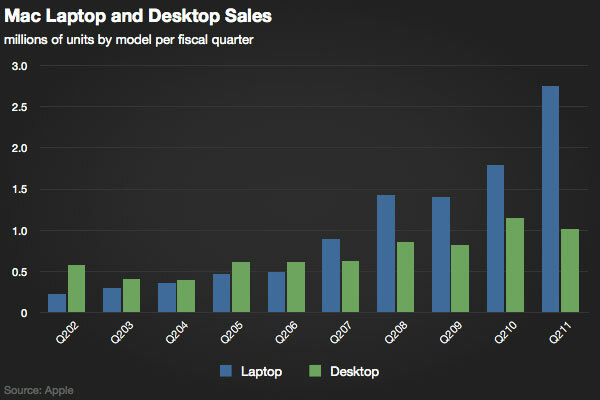 By the end of the calendar year, it’s likely three out of four Macs sold will be portables. The inexorable trend towards niche status for desktops continues. Another inescapable conclusion seems to await the iPod: stagnation. Apple sold 9.01 million iPods in the quarter, compared to 10.89 million last year, down 17 percent. Overall, iPod sales have been down or flat since 2008, as the dedicated media player market reached saturation. However, even as overall sales went flat, the iPod touch continues to see growth. Apple has reported the iPod touch now accounts for about half of iPods sold, which is a big boost for the iOS platform. Another boost to the iOS platform, the Verizon (s vz) iPhone helped to propel sales to a new record of 18.65 million sold. That’s more than double the number sold for the same period last year, and also beats the previous record set during the holiday quarter of 2010. While we don’t know the exact number of Verizon iPhones sold yet, we do know AT&T (s t) sold 3.6 million. 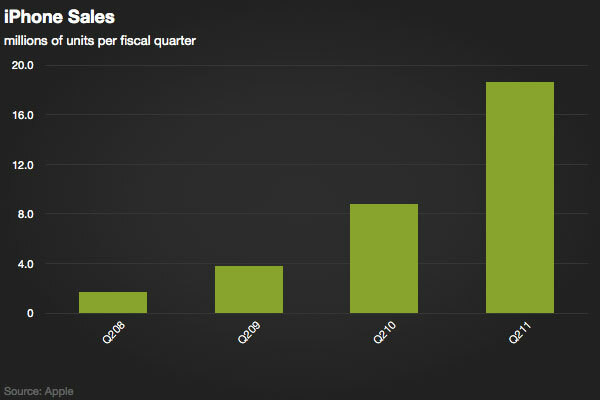 Expect Verizon iPhone sales to meet or exceed that. As for the iPad, the best-case scenario is that supply constraints and damage to parts production from the earthquake in Japan impeded Apple’s ability to get devices into consumer hands, as Apple sold 4.69 million units for the quarter. 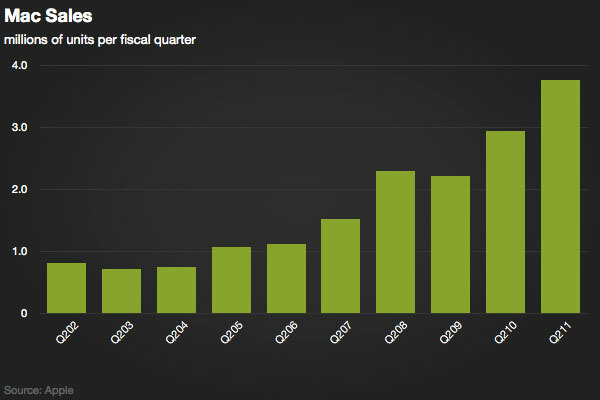 That compares poorly to over 7 million units last quarter, which admittedly was the holiday quarter. 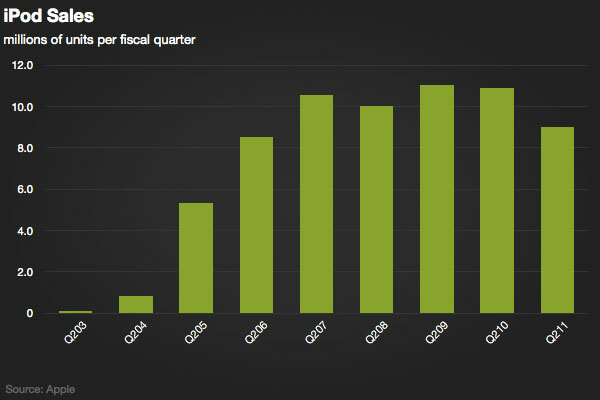 However, that number barely exceeds the quarter prior to that, which was 4.18 million. 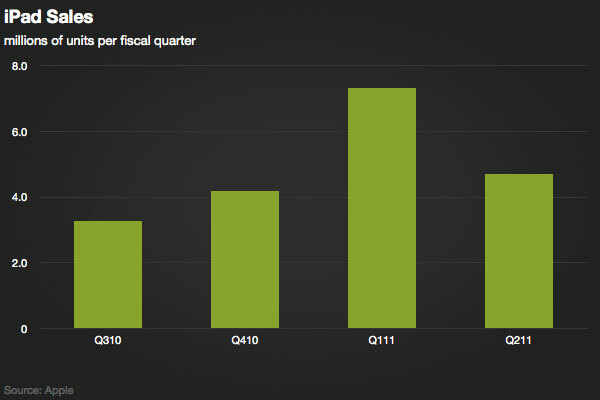 Apple will need to do some explaining at the conference call on those iPad numbers. Hopefully, that will be done by Steve Jobs. It’s hard to imagine Steve Jobs not showing up to trash talk the PlayBook (s rimm) at today’s conference call. Jobs was absent for the call in January, but made the iPad 2 event in March. Whether or not Steve Jobs is at the today’s call, TheAppleBlog will be providing highlights immediately following. WRONG!!! More like 2.2 Million. Wow you are way off. so the total iOS sales actually decreased for this quarter compared to previous quarter, when you factor in the sales of IPad and slowly decreasing iPOd sales. So it looks like wall street likes short-term phenomenon, only that can account for their enthusiasm for yahoo as well.